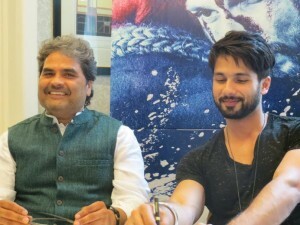 BollySpice caught up with Director Vishal Bhardwaj and actor Shahid Kapoor over a round table discussion in London. Exploring Haider, the upcoming Bollywood adaptation of Shakespeare’s Hamlet, we delved further on the significance of Kashmir as the backdrop, what it took to prepare for the challenging role of Hamlet, why Shahid Kapoor was specifically chosen to play the part and much more! Haider completes Vishal Bhardwaj’s Shakespearian Bollywood trilogy, the former two being Maqbool (Macbeth) and Omkara (Othello). Haider stars Tabu, Kay Kay Menon, Irrfan Khan, Shahid Kapoor and Shraddha Kapoor in the lead. PRESS: Why did you choose to shoot the film in Kashmir? You’ve already been asked that question a hundred times! Vishal Bhardwaj: But every time the answer is not the same! I was looking for a backdrop to Haider. And Macbeth, my Maqbool, the film was placed in the Mumbai Underworld and in Omkara it was the hinterland of Uttar Pradesh. That’s why I was looking for a new backdrop for Haider. And I felt that Kashmir should be my backdrop because – well people will see the film and decide – but I feel they haven’t made a film on Kashmir. PRESS: Was it easy or difficult to film there? Shahid Kapoor: Is it ever easy to film anywhere!? Vishal Bhardwaj: Yes anywhere you make a film – it is not easy! We were hoping – not hoping but expecting – that we’ll have trouble but it was actually a very smooth shoot. From the administration to the local public, everyone was very co-operative. The local people were very excited that a full Bollywood film was being shot there. In fact, the whole unit was recognised with the name of Haider. If they say they are from the Haider unit, they are treated very differently. The film was in two seasons, it was written in two seasons, autumn and winter. So autumn happens there in October-November, and then winter starts in January. In October-November we were there for twenty days. And then the next was thirty, thirty five days. 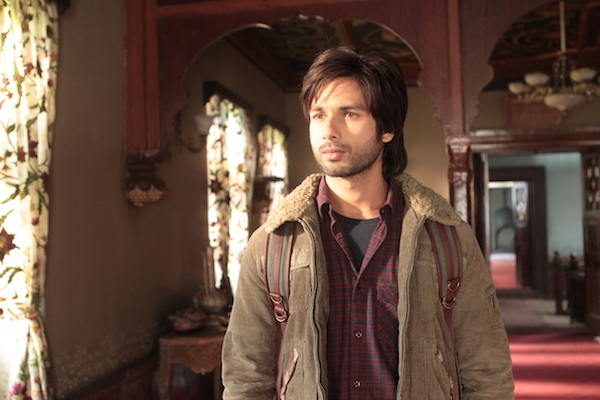 Shahid Kapoor: We shot through this period called Chillai Kalan. Vishal Bhardwaj: Chillai Kalan is the coldest days of Kashmir. Shahid Kapoor: Chillai Kalan – from the 15th of December till the end of Jan they consider the coldest period there and they used to always ask us with eyes wide open: You are shooting in Chillai Kalan?! [Laughs] What is Chillai Kalan- is it a dish?! And they’d be like – oh even we don’t get out when it’s that cold! Vishal Bhardwaj: It’s really cold! PRESS: Did you work at a particular time in the day? Shahid Kapoor: Whenever the sun was out man. We used to start very early. In fact I got lucky on a few days when we were shooting the climax – the set was at the location of a graveyard. It was a complete set that we had put up. Actually something really interesting happened. There was a house and then there was a graveyard in front of it – that’s the set we shot at and I remember, we would have our lunch and all in the hall. We shot a lot of portions in the house. As we were walking back I said to Vishal Sir – so whose house is this? He just turned around and looked at me and started laughing. He said that’s the set! I didn’t realise! I’ve been doing this for eleven years – I shot in it and I didn’t realise it’s a set! So that’s how amazing that whole thing was. But yes. They used to start sometimes very, very early actually – 5:30. I had as well but there were certain days I got lucky. It was just too cold. Early morning still the sun did not come out, especially at 7:30-8, the sun did not get nice and strong. It was unbearably cold. Vishal Bhardwaj: We didn’t feel like any breakfast. That’s why we used to have a break later when the sun is out otherwise everyone did not feel like having breakfast. Shahid Kapoor: And Sonmarg, there’s this place called Sonmarg which is way up. I remember getting there and I got there 45 minutes before, I remember I was driving towards where all the vans are parked and everything. I just felt like I’m watching a painting. Because nobody moved… I actually got down and then I also froze! I realised it was so cold, nobody could move! PRESS: When one mentions Kashmir, what comes to mind is the Partition of India. Hamlet obviously loses his father. Is the Partition something that you touched upon? Do you explore identity and belonging? Vishal Bhardwaj: No, the film is based in the 90’s. So I don’t touch on the Partition, but you know, we really need to make a good film on Partition… Only Garam Hawa I think was. Shahid Kapoor: Garam Hawa was fantastic. Shahid Kapoor: Well most people at least, you’ve read Shakespeare in school. So of course my father is somebody who has done a lot of stage and he really loved Shakespeare. Vishal Bhardwaj: He wanted to make Hamlet with him long back. Shahid Kapoor: Yes before I became an actor you know the first things when he spoke to me was, if you want to not just be a star and also be an actor, then maybe you should debut with a film like Hamlet then at least you will get to do something as an actor! So him making that mention 10-12 years back and I actually got the opportunity to do it. So I think obviously Hamlet is a very, very coveted part. Most actors would know about that. It’s a huge compliment just to be considered for it to be very honest. And very daunting to actually play it. And you really do literally feel to be or not to be as an actor. Because you wonder whether you’re capable to do something that you’ve taken on. So I was actually very, very excited. And I really pushed Vishal Sir – when he said you have to go bald I actually said yes immediately! Because if that’s what it takes I’m going to do it. I want to play this role. PRESS: Did you lose out on any other films because you went bald? Shahid Kapoor: Let’s not go there [laughs] Yes… I did sit at home for four months. I had to grow my hair back and I’ve actually started to shoot a film now. And we finish this film in March. PRESS: Was there a certain scene or aspect of your character which made you uncomfortable? Hamlet is certainly a very dark character. Shahid Kapoor: I feel very comfortable in uncomfortable spaces as an actor. It’s actually very scary being comfortable as an actor because then you are pretty much probably repeating yourself or doing something that’s already been done. In fact I read an interview of Leonardo Di Caprio and he said if I read a script for the first time and I can understand how I want to play the part, I don’t do it. I always do a film that I don’t get the first time. If I don’t know how to play it, I actually sit and read it again because I know that it’s making me enter an area which I probably haven’t attempted yet- that’s why I don’t know how to play it. So it was very interesting and huge learning. Usually it’s the other way round when you feel like – yeah man! I know how to do this, you know. But you’re probably feeling that because you know, you’ve probably done something similar already. Shahid Kapoor: Yes. I think originality can only come in spaces which are unexplored. So if you want to try and do original work you have to learn to take risks. PRESS: Vishal ji, why did you choose Shahid? Vishal Bhardwaj: Young! But I think Shahid is the best actor in his age group. Because actually the young generation which is coming, you know they are good trained actors. But I had to make a choice and I thought that Shahid is one of the best actors in his age group. And we had done work together. We knew each other. I knew the kind of challenges this film will have- this script will have. So I needed someone who I have a rapport with and who can trust me- we both can trust each other. PRESS: How has the experience been in this film after Kaminey? Shahid Kapoor: I think our relationship has grown a lot. We had a good relationship in Kaminey for sure. But this film, I don’t know, I just feel a lot more connected with him. What he feels and thinks really matters to me. I’m rather dependent on him as an actor. PRESS: How did you prepare for your role? Shahid Kapoor: The most amount of time you need to spend is with the film maker to know what he expects of you and to try and discuss things in as much detail as you can. We did script readings with the entire cast which was full of some fantastic people. So that was awesome. Getting the look right – the first thing Vishal Sir said was I that I don’t want Haider’s eyes like your eyes are, we should try lenses. So I am actually wearing lenses in the film, lighter than what I have. Because most Kashmiri people have slightly lighter eyes. Shradhha is the only one who didn’t have to wear lenses in that weather. You know what happens with lenses is that they dry out. And when it’s minus 15, it’s like you’re putting a stone in your eye. So I think that was a huge thing for the character. It really changed a lot with that one particular change. So it’s more than just changing your clothes. Eyes are such an important part of an actor’s ability to emote. I think that made a huge difference. Obviously the look is drastically different than anything I’ve done before. But you know, at the end of the day having said all that, eventually it’s the mental journey that you need to understand how to interpret when it comes to a role like Hamlet. It’s not just the physicality of the part… you just have to give yourself to it. And go. PRESS: Vishal Sir, you mentioned that Kashmir is almost like another character in the film. What are the plans to screen the film in Kashmir especially? Vishal Bhardwaj: Yes we actually have sent a proposal to chief minister Mr Omar Abdullah. There are no working theatres in Kashmir. And I really want the Kashmiri’s to experience this film on a bigger screen. So we are proposing to have a moving theatre kind of thing. Which we can set up… and where we can allow Kashmiri’s to see one show a day once it’s dark. I hope he accepts and they get to see it. PRESS: What about Maha Kaminey – is that something we can hope for? 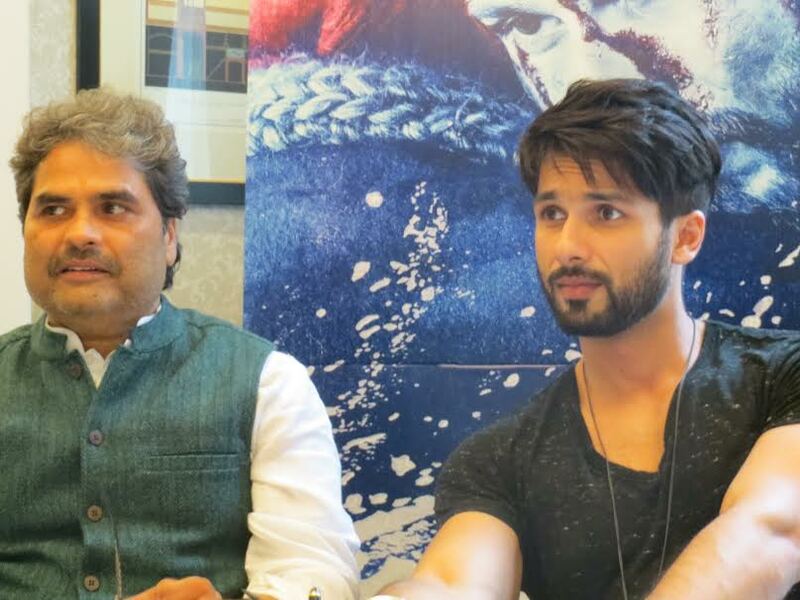 Vishal Bhardwaj: Yes, we definitely have to make that film. Watch this space for upcoming Haider details! The film releases on 2nd of October, 2014.